The right hinge of my friend's 200LX disintegrated entirely and broke away. The result of WD40. 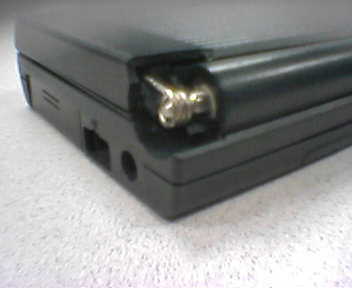 Here's how I made a substitute hinge for him using a paper clip. Wash your hands thoroughly first to remove sweat from your fingers. Otherwise it would cause the paper clip to corrode. Make about 3 coils with the paper clip like below. The long end is about 2cm. Use the wire snippers to cut the paper clip. Note the direction of the spiral. 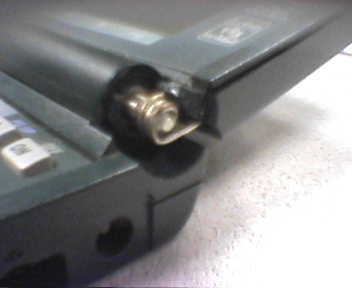 The diameter of the coil is slightly larger than the steel pin that is left on the 200LX's right hinge. I made about 3 coils around a Philips screw driver (cross head). Fit the coil over the steel pin on the 200LX and adjust the diameter so that the paper clip rotates around the pin smoothly. I must confess that the picture below is doctored; my work is not that neat. Now peel open the corner of the sticker on the screen that has the "Lotus 123" logo on it. Beneath it, you'll find a screw. Loosen it a little with the Torx#6 screw driver, pry open the two halves till there's a small slit, and push the long end of the paper clip into the slit. Be careful not to use brute force as the screen's cables are there. Fit the coil over the 200LX pin. Now adjust it so that the screen can open and close. Bend the paper clip a little if needed. Once satisfied, carefully tighten the screw to hold the paper clip in place.